From January 2005 all vessels over 15 metres in length either registered in the EU or fishing in EU waters have been required to carry Vessel Monitoring Systems (VMS). Each vessel carries a combined GPS/VMS transceiver which receives data from GPS satellites and transmits this position to shore at regular intervals. Along with position, information on vessel speed, heading and catch reports can also be transmitted. 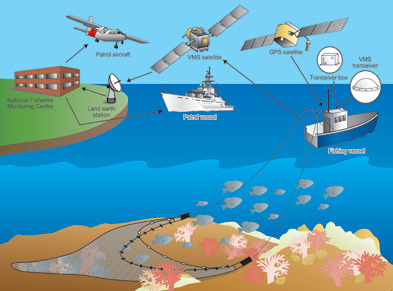 The main satellite communication systems used for fisheries monitoring are Inmarsat, Argos and Euteltracs. These systems have the potential to transmit and receive information such as weather reports, scientific data, and personal communications. Click here for a larger, interactive image. Elements of the Vessel Monitoring System © Jason Hall-Spencer (2005). It costs less than one Euro per day per vessel for VMS surveillance and allows for the first time fisheries protection agencies to have a clear overall picture of the activities of the high seas fishing fleets. VMS may not replace existing patrol methods, but it will help to make existing methods more cost effective.